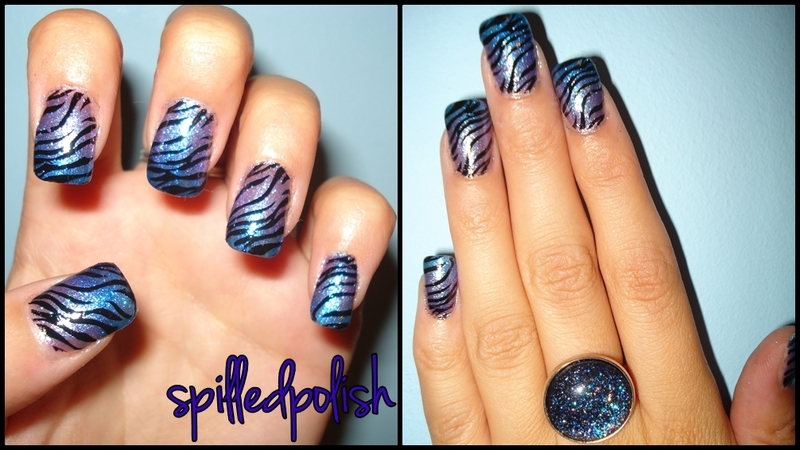 spilledpolish: Faded Nails: Purple - Blue .. & Zebra Print! Faded Nails: Purple - Blue .. & Zebra Print! I went to the CNE (Canadian National Exhibition) yesterday and picked up some nail polish for CHEAP! (They were on sale for 1 for $1.25!) I figured they would be all the ugly boring colours, but I happened to grab 4 that I absolutely loved at first site! I managed to pick up four colours from Sally Hansen. I got 3 from their HD Hi-Definition line (14- Spectrum, 15- DVD, and 16- Laser). In my nails below, I used DVD & Laser and faded them into eachother, and stamped a zebra print design over top :) ENJOY!